To find out more about our bushcraft courses, and to book, simply select from the menu above or click below for further details. We’ve put together a range of courses to meet the needs of the beginner through to the more experienced. You can dip your toe in the water with our introductory 2 Day Bushcraft Course, or go for a more immersive experience on our 5 Day Bushcraft Course. If a qualification is important to you, try the IOL Foundational Bushcraft Certificate. We run weekend and single day family bushcraft experiences to give you and your children a never to be forgotten experience. It’s great for family bonding and teaching your little ones great tricks to survive in the wild. We also provide a wide range of courses covering topics such as foraging, nature awareness and many more. 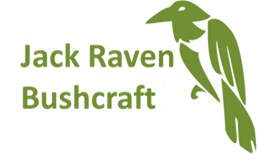 Jack Raven Bushcraft courses take place in Westwell, Kent, just 50 miles from the centre of London, in spectacular ancient woodland. We are located in a designated Area of Outstanding Natural Beauty. We have access to around 60 or so acres of broadleaf woodland. Our camp is in a private woodland, which itself is in the middle of private land. It’s the perfect environment for you to learn survival techniques and skills. All of our courses are designed so that you don’t need any previous wilderness survival experience, and are entirely hands on so that you leave us with having the real experience of practical and repeatable skills. If you fancy a challenge you can try our five day survival course where during the first three days we will teach you all you need to know about surviving in the wild. Then on the last two days, it’s up to you to put your survival skills into practice. What facilities are available on your courses? So that you can effectively learn the skills that we teach, we have created a learning environment in the woods. Our courses are based at an expedition style camp with a yurt and wood burning stove, a parachute, a kitchen area, work benches and a composting toilet. We have areas where you can pitch a hammock, tarp or small tent, cleared of standing and hanging dead wood, or you can camp on the adjacent working farm campsite.